Like the old MGM movie mascot, a lion parades in front of you and growls as a signal to his mate in the African bush. 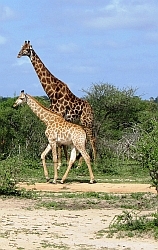 Giraffes poke their heads atop of trees and pluck off leaves to eat and a long and lean leopard chases after his prey. A colony of deer forage for food. All of these scenes are in South Africa awaiting visitors to this cosmopolitan country that offers a variety of experiences in addition to the wildlife. But let's start with the wildlife and the way I experienced it. I stayed at Mala Mala Game Reserve located adjacent to Kruger National Park. The Reserve provides unimpeded access to wildlife and members of the Big Five: lions, leopards, buffalo, rhinoceros and elephants can be viewed on a daily basis. The day at Mala Mala begins with a hearty breakfast and is followed by a game drive. Guests at Mala Mala board jeeps with a maximum of six passengers and are guided by an experienced rangers who know where to find wildlife and are familiar with all aspects of bush ecology. A delightful excursion into this cornucopia of colors is made easy by riverboat. 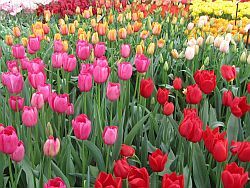 My husband and I recently returned from a "Tulip Time" cruise aboard the AMA Prima, launched in 2013. The 9-day cruise began and ended in Amsterdam and visited the port cities of the Netherlands and Belgium including: Volendam, Edam, Arnhem, Nijmegen, Antwerp, Ghent, Willemstad, Kinderdjik and Ultrecht with an optional excursion to Brugge.